Eggs, the most versatile ingredient in the culinary world is the theme for this month's IMBB that is hosted by Seattle Bon Vivant. It opens several culinary gates. My sweet-obsessed brain could think of mainly desserts. I had to steer clear of my obvious dessert choices- a flan, souffle, angel food cake and the like... So here are three, of my contributions starring the humble egg. Eggs for breakfast or even for a light lunch cannot go wrong. I made a decadent Italian egg sandwich for lunch. May be this should have been reserved for the Eggs on Toast event, but anyway, this is really good. Few simple ingredients combine together to tickle the tastebuds with a variety of tastes and textures. For added richness, I drizzled a little bit of truffle oil. I usually like my eggs well-cooked but in these fried eggs, luckily, none of the egginess comes through despite the slightly runny yolks. 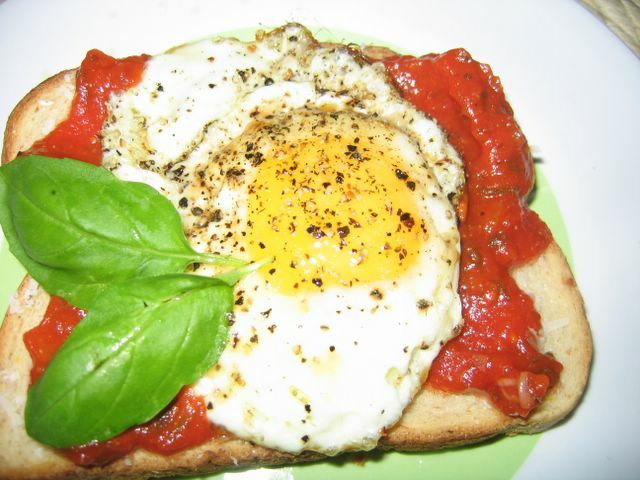 When I bit through the crunchy bread, all the flavors of the basil, marinara, parmesan and the crispy edges of the fried eggs came through in layers. When done, only the flavor of the rubbed garlic remained on the palate. 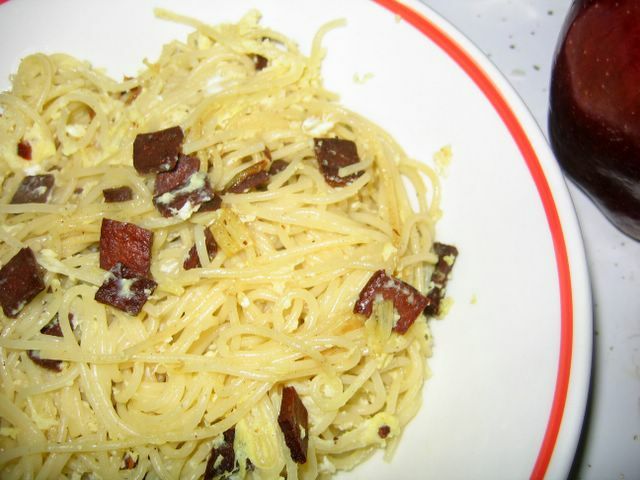 Pasta carbonara is a dish I have been waiting to try but resisting due to the runny eggs it will have. I decided to bite the bullet. With a vegetarian version of Canadian bacon and a Tyler Florence recipe, the pasta turned out yummy without any egginess (I cautiously did not use the Batali recipe, here). I bet it tastes so much better with REAL bacon. What a satisfying supper to curl up with! Here is the dessert I had promised. These coconut crepes are really simple. It is a Malaysian dessert that is also made in certain regions of southern India. My mom got this recipe from my aunt and this is the first time I made this one after eating it several times in my mom's kitchen. Mix the grated coconut, brown sugar and granulated sugar and salt together. Fry the mixture in a dry pan over medium/low heat, constantly stirred for approximately 5 minutes, or until the mixture is dry and jam-like. 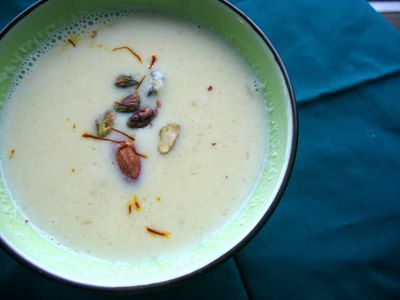 Mix in cardamom and set it aside. Mix the flour, coconut milk, ½ tsp. salt, green food coloring and eggs into a smooth batter. Lightly grease an 8-inch frying pan with clarified butter or butter, and pour 3 tablespoon of the batter into the pan. Make sure the pan is equally covered with the batter so it becomes a thin crepe. Fry for one minute, turn the crepe over and fry for another minute. Remove and set aside. Place 2 Tbs. of the coconut mixture on the near edge of the pancake. Fold over once, then tuck in the left and the right sides and fold over once more. Press gently to distribute the filling evenly. This is not much to look at (since I don't tint the crepe green), all white and hiding the luscious filling inside. You have to have it hot, or else the crepe becomes too tough and leathery. So no photo for this one! tag- you're it! just kidding. i'm actually tagging you for the cook next door meme. check out my blog and participate if you want to, otherwise, disregard! All three with eggs sound delicious, Mika, particularly the coconut crepes. I am the cook next door!